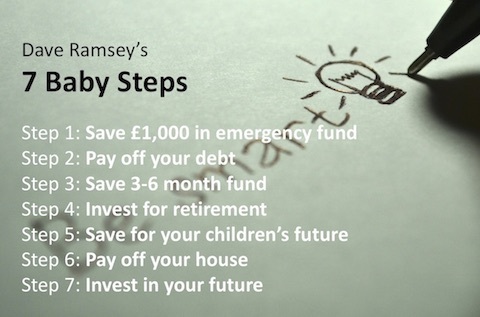 Now that you have completed step 1 and saved your £1000 emergency fund in your fixed rate interest paying account, you’re ready to tackle step 2 and pay off your debt. There are two types of debt, good debt is buying a home with a mortgage which you can enjoy every day. Bad debt is reaching for the latest technology when last years technology is still very usable. TIP: If you are serious about getting out of debt then you must get control of your spending, and I suggest leaving your credit card at home so you cannot use it. In baby step 1, we have put in place several good budget practices, we can now focus on reducing our debt. Using the Dave Ramsey debt snowball method is a great way to knock out your debts one by one and becomes very motivating when you see the progress being made each month. Welcome to the Finance 101 course, designed for everyone wanting to get off to a good start in life and over a few weeks, we’ll work through the seven baby steps (Source: Dave Ramsey). Two years ago, I moved into my new home in July, and when the weather got colder in October, my hot water boiler failed, and instead of reaching for my credit card, I had my emergency fund available to pay £1200 and have it replaced with a brand new one with a 10-year guarantee. Life teaches us that unexpected things happen and having this small safety net, will help you start to break out of the debt cycle. During my career, I’ve been very fortunate to work with many fantastic graduates, and during recent conversations, it became clear that there was a demand for an introductory course to money and finance. Personally, I’m amazed that our education system (at least in the UK) does not teach the basics and I hope that over the next several weeks, we can work together through a seven-step plan to help you get control of your finances and not the other way round. Disclaimer: I’m not a financial adviser and am speaking from my own personal experience. Former US President, Benjamin Franklin once said “An investment in knowledge pays the best interest”, and he was absolutely right, because the financial markets are designed to extract the maximum value from each transaction and if we’re to be on the right side of the trade, we should prepare to roll up our sleeves, learn and act.